The Linn of Tummel is a spectacular site. Fast moving water flows over and around the rocks to create a perfect rapid for white water rafting. The water roars as it progresses over the two steps that make up the Linn of Tummel the final rapid on the River Tummel. These two steps total 18 foot of vertical decent! The Linn is a spectacular end to a spectacular river experience. However, there are excellent non-rafting activities in the area, like forest walks and of course white water raft watching, which is sometimes as popular as the rafting itself. The Linn is located deep in the Tummel Valley, drive along narrow winding roads, tall woodlands and majestic hills. This is Highland Perthshire at its finest. The Linn of Tummel circuit by Walking Highlands sets out an excellent 6.75-mile walk click here for more information. The River Tummel flows into Loch Fascally, this is a man-made reservoir created by the Pitlochry dam of 1950. Before the dam was built it would have been a truly spectacular site, possibly even more so than today. The natural beauty of the spot was so spectacular it was once visited by Queen Victoria. The Royal visit is marked by an obelisk to this day. Note: Please be careful when in the vicinity of fast-moving water, rocky outcrops and difficult terrain, the water takes no prisoners. Always stay safe around the edges. 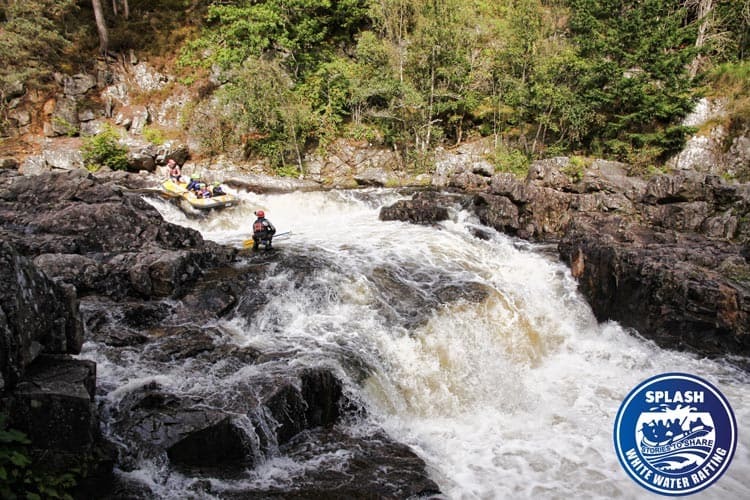 Bellow is a selection of videos showing the thrill and excitement of rafting with Splash over the Linn of Tummel. Check out our Tummel page for more info. Enjoy the Linn and remember always be alert around rivers and don’t leave your litter behind.